Emperors and gladiators and tigers, oh my! 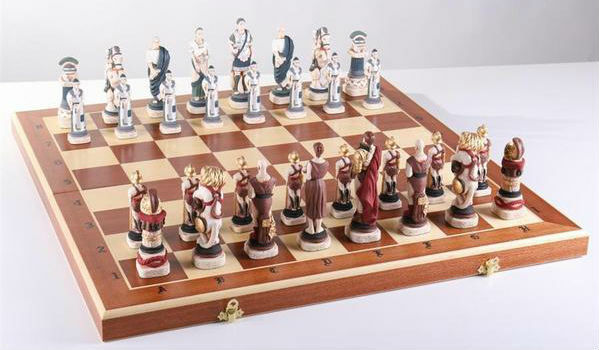 These Roman chess sets allow you to take part in some of the most ferocious conflicts in ancient history. Chess is a game of skill and strategy. Elite players spend years studying openings, memorizing positions, and mastering endgames. 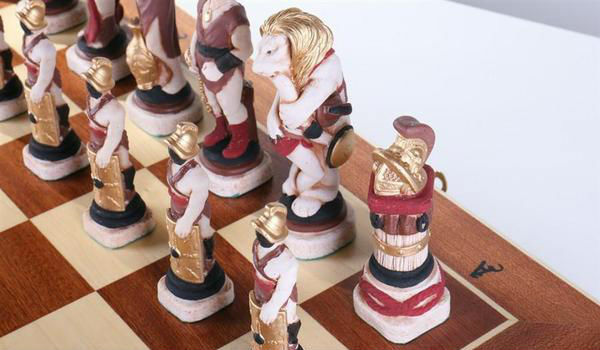 The standard Staunton chess set makes it easy to view the game as it exists on the board, but for some players, themed chess sets take the game to a whole new level. This is definitely the case with Roman Chess Sets. 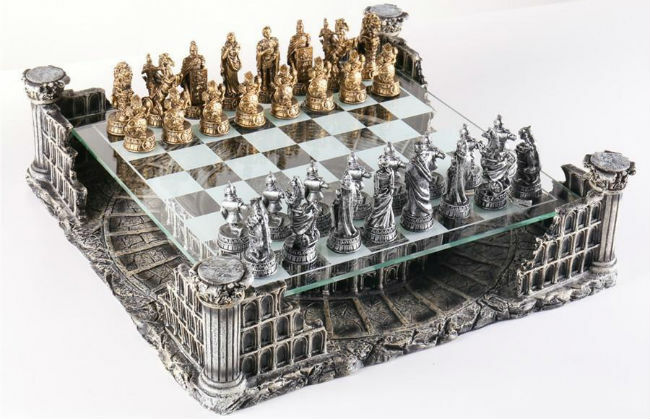 Rather than imagining the battle playing out with traditional chess pieces, these kinds of themed chess sets pit two armies against each other – often on a beautifully-designed chess board that looks like some sort of arena or battlefield. On this kind of chess board, we see more than a bishop removing a rook or a knight knocking out a pawn; we get to watch a fight to the death. In this article, we’ve reviewed some of our favorite Roman chess sets. The sets featured here were chosen based on their quality and uniqueness. Any of them would make a breathtaking addition to your study or living room table. 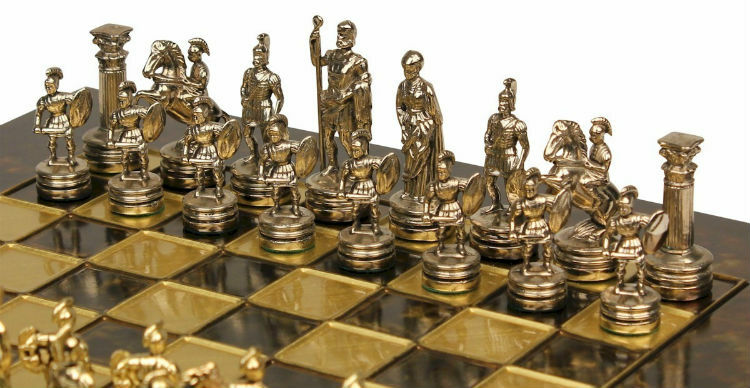 This beautiful Roman Gladiators 3D Chess Set features a strong band of gladiators (in gold) facing a poised army of Romans (in bronze) and ready to engage in an epic fight in a truly splendid setting: an ancient Roman Coliseum. 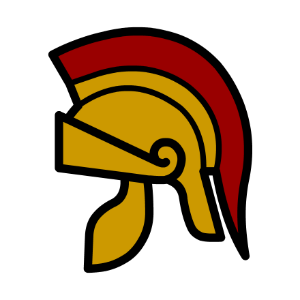 Will the fierce fighters be able to remove the Roman emperor from his high throne? We say it in so many of our reviews, but let us repeat it here once more: We love chess pieces that are made of pewter. The craftsmen who created The Roman Gladiators 3D Chess Set opted for heavy-duty pewter, which means that the Roman chess pieces are not only highly detailed; they’re also nicely weighted for ultimate control during battle. Each Roman piece features a felted bottom so you’ll never have to worry about scratching the glass chess board. Among the pieces, gladiators stand tall and their lions roar on one side as the Roman nobles and their infantry prepare to defend the crown. The kings on both sides measure 3 inches high and their base diameter is 1 1/4 inches. Among the pieces, gladiators stand tall and their lions roar on one side as the Roman nobles and their infantry prepare to defend the crown. Featuring clear and frosted squares, the 16-inch game board is arranged in a manner that creates a simply stunning display: it’s suspended by a Coliseum in the midst of which you can see a spear-strewn arena. All of the action takes place above this arena (on a playing surface that measures 13 5/8 inches); you can imagine the crowds roaring with excitement and groaning when a favorite falls and rises no more. The majestic columns and crumbling architecture lend a real sense of history to this Roman chess set that’s truly a great value for the price. The Spartakus Chess Set features a full set of Roman chess pieces that are each beautifully hand painted and formed from ground marble. Both their intricate detailing and their towering height make these unusual chess pieces an eye catcher. The King pieces, modeled after real historical figures, both stand a remarkable 5 ¼ inches tall! Even the pawns in this set are taller than the King pieces in many other sets, at 3 ½ inches tall. Needless to say, these sizeable Roman Gladiators chess set pieces are also quite weighty. The whole set together weighs in at 5 pounds! A portable chess set, this isn’t. However, you won’t need to worry about searching high and low for a suitable chess box, because the folding design of the board provides perfectly sized, padded slots for each piece. Speaking of the chess board, the large, 23 inch square board weighs over 5 pounds as well. Made of solid oak wood, it features 2 ½ inch squares that provide ample playing space, even for the large chess pieces. As we covered before, it serves as both the chess board and the chess box for this Romans chess set because of its clever folding design. When not in use, the whole set folds up into one compact package. When unfolded, it is immediately ready to play and display. Supplies of this unique item are limited, so don’t wait too long or you may miss out! Playing with themed chess sets is infinitely more interesting if you know a bit about the theme. We’re not talking boring dates and names, either. Here are some super-cool facts about the Roman Empire to muse on while you’re waiting on your opponent to make their next chess move. While some gladiators were slaves, others were free men who trained with gladiator schools and arrived with the backing of a promoter (think of today’s prize fighters). Training and feeding these athletes wasn’t cheap, so none of the promoters were happy to see a pair trying to kill or hack one another to bits. It’s most likely that gladiators were trained to wound one another rather than fighting to the death. Roman emperors were a paranoid bunch, evidenced by the fact that they were constantly worried about being poisoned. They were so concerned, in fact, that emperors would consume a small amount of poison every day in hopes of becoming immune to it. No worries, though! Should someone slip a vial of something deadly into an emperor’s food or drink, sipping something from a vessel made from the horn of a one-horned horse or donkey from India (uh, we have no idea, either!) was sure to counteract the poison. The city of Rome was founded in 753 BC, but by just 117 AD, it had expanded to include all of modern-day Italy, lands in the Mediterranean, and a huge swath of Europe that included England, Wales, and some of Scotland. Many of the Roman Empire’s wars were fought over trying to expand those boundaries, while other battles were fought over religion. Still Looking for a Chess Set? We hope you like the detail and quality of the Roman chess sets featured in our reviews. 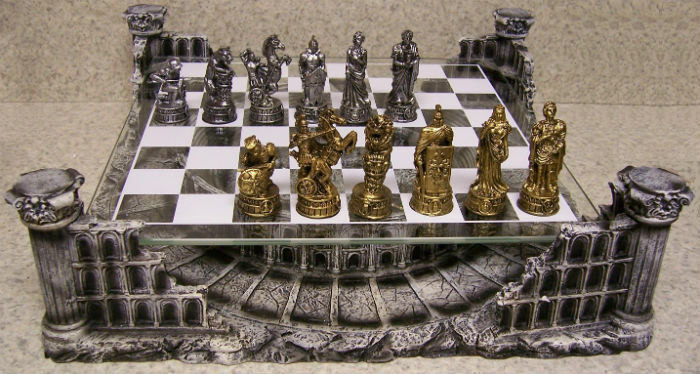 If you’re still looking for the ideal chess set – whether your interests lie in history, comics, or sci-fi/fantasy, check out our reviews of The Best Themed Chess Sets to see if something there will suit your fancy. Chess Set Reviews: Our Reviews List of the Best Chess Sets of 2019. Ivory Chess Sets: List of the Best Ivory Chess Sets for Sale in 2019. Wood Chess Set Reviews: Reviews List of the Best Wooden Chess Sets Online. Unique Chess Sets: The Coolest and Most Unique Chess Sets Online. Civil War Chess Sets: Reviews List of the Best Civil War Chess Sets of 2019. The Best Super Mario Chess Set: Review of the Best Super Mario Chess Set Online. Fantasy Chess Sets: Fantasy Chess Sets: The Best of 2019.